The first scientific meeting was held on Tuesday 6-1-2019 to celebrate demonstrators and lecturer assistance that got Master degree and PhD In 2018. 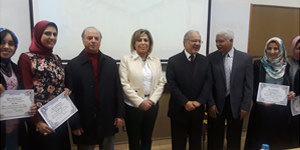 Prof. Dr. Ezzat Hassan, the Dean and Prof. Dr. Mervat Osman, the vice Dean welcomed Prof. Dr. Mahmoud Mohy EL- Din, the president of PUA and Prof. Dr. Mohamed Helal, vice president for research and postgraduate studies. The attendance listened with amazement to summaries for the represented researches. The attendance appreciated the high level of scientific researches. The objective of our faculty administration is to improve the academic and practical skills of the demonstrators and lecturer assistance. To achieve this aim, administration of Faculty of Allied Medical Sciences and Pharos University, encourage the staff members and their assistance to get the highest level of the experience and improve their laboratory skills such as data interpretation, problem solving, experimental design, improving scientific writing collaborative work, extract knowledge from articles and literature reviews, communication with their partner from all over the world. All of these are fundamental to build the scientific expertise and in turn enrich the field of academic education with a selected and elite academic members who able to provide high level of education, practical experiences, scientific research and their applications in the field of medical laboratories. Therefore, the university and faculty administration strive to provide all the laboratory possibilities, facilities, the most advanced equipments and tools that allow the members of the lecturer assistance to conduct tests, analyzes their data accurately and achieved the practical tests as soon as possible. All of these prompt a new generation of faculty members to pursuit in their research continuously and to be innovative in their field.